This blog post originated from a conversation on the e-list group of my professional organization, Career Directors International. The discussion was about good strategies for stay-at-home-moms who are transitioning back to the workplace to account for that time gap on their resumes. I myself have a few time gaps in my career, but for a different reason. Being a bit of a vagabond by nature, particularly when I was younger and unclear on my career path, I took several extended international trips lasting 2 – 6 months that were always followed by a transition/relocation period. Clients of mine have repeatedly asked how to address time gaps due to caring for health issues of elderly parents, or children with special needs. Sometimes it’s a personal tragedy, such as the sudden loss of a partner or child that keeps people from working for larger chunks of time. 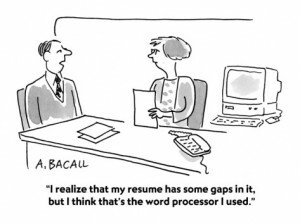 2) it’s important to not leave that gap unexplained on your resume. It’s best to foresee the employer’s question and address it briefly in a way that satisfies their concern/curiosity, but doesn’t give away too much information, or information that sets them or you up for legal issues such as discrimination. Give yourself a “job title” to explain your activities & follow the same format as your work history. Do include any career related activities you did during that time, such as taking a related class or workshop, or applicable volunteer work & any associated accomplishments. Temporarily out of workforce to manage family commitments. Completed project management (PMI) courses. Earned PMP credential. Took time off to pursue personal goals and relocate to Florida. Secured $10K grant for local school as a volunteer during this time as well. Explored culture and history in: India, Sri Lanka, Great Britain and Ireland. Relocated to Portland, OR. Remember, it is not wise to mention anything specific about children, period. The law is that companies are not allowed to ask about kids, day care plans, etc., but, I know I’ve had interviewers ask me whether I have kids or plan to have kids. Don’t bring it up yourself for sure! You may have read that you can take stay-at-home mom activities and use them as “transferable skills” – such as scheduling, budgeting, organization/multi-tasking & these types of examples. While you can try that, it is stronger to list experiences or activities such as training, volunteer work, or contract projects that are more directly relevant to your job search. It can be tricky figuring out how to address a job gap on your resume by yourself. Let me help —>>Contact me!